Say Anything bassist Alexander T. Kent has left the band. On the band’s upcoming tour, Kent will be replaced by Kenny Vasoli, the lead singer and bassist of The Starting Line. “It really has been a wild ride. I remember so well the fairly warm December night 6 years ago at Chain Reaction when Max asked me to play in Say Anything. I’ve learned and grown so much while being in this band and these words will not come close enough to expressing the gratitude to everyone in the band, everyone who worked for and helped the band, and all of the amazing fans who took time to come see and talk to us. Thank you. I wish the very best to Say Anything and everybody in it. Thank you all so much for all the experiences and memories. UPDATE: The song was unfinished and leaked. Kanye has chosen not to release a new GOOD Friday track this week because of the leak. Check out a new Kanye West song featuring Bon Iver called “Lost in the World”. Kanye West‘s new album, finished but still untitled at this point, has a fluctuating release date. A few weeks ago, Kanye said the album would be released on November 16th. Rap-Up says November 22nd. In collaboration with clothing brand Keep, Animal Collective is producing a new line of shoes. Avey Tare has designed the Tobin, the first shoe of many produced by the band. Although the shoe does not ship until March of 2011, it can already be pre-ordered for $75. These preorders will include a bonus cassette of never-before-heard material from the band. All profits made from the shoes will be donated to the Socorro Island Conservation Fund. Bruno Mars‘ debut album, Doo-Wops and Hooligans, is streaming on MySpace. Doo-Wops and Hooligans will be released on October 5, 2010 on Atlantic Records. Stream and check out a review of Sufjan Stevens‘ new electric album, The Age Of Adz, at NPR. Lil Wayne is Not Bill Gates? Lil Wayne is almost out of jail, but this week his birthday mini-album I Am Not A Human Being will be released by Young Money. You can download the song “Bill Gates” from I Am Not A Human Being here. 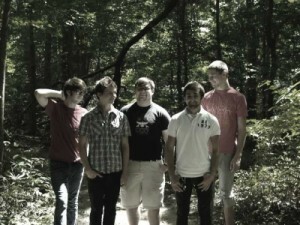 Last week, we introduced you to Looking For Alaska, an indie rock band from Memphis, Tennessee. If you haven’t already checked out their debut EP Everything We All Wish We Could Be, download it for free here or purchase the EP from iTunes. We got a chance to talk to the members of Looking For Alaska (Chad, Calvin, Joshua, Garrett, and Chris) and here is our interview. For our readers, could you please state your names and what you do in the band? Chad Turner: I sing and yell. How did Looking For Alaska come to be?